"Death for A-Spies"-- Julius Rosenberg & wife Ethel Rosenberg get the electric chair/death penalty for giving A-bomb secrets to the Russians through diplomatic channels New York, NY Tilt down EST shot federal court building in New York City; MS of JULIUS ROSENBERG handcuffed to MORTON SOBELL (hiding his identity under a jacket) exiting paddy wagon; MS Julius Rosenberg; MS of ETHEL ROSENBERG turning head to camera; MS Ethel Rosenberg entering federal building, press photographers taking picture, flashbulbs going off; MS of DAVID GREENGLASS posing with federal agents, being led into fed bldg; MS Judge IRVING KAUFMAN sitting at desk, posing for press photographers, flashbulbs snapping; MS U.S. Marshal paddy wagon pulling away, press photographers snapping pix; l/a MS street light, signs reading Foley Square & One Way street. Footage depicting spread of communism from 1924-1956. Static shots of the globe fixed on the USSR (in red) and slow gradual spread of communism with arrows and dates. Good for crude cold war, spread of communism, red scare depictions. Static shot of a globe, with the Soviet Union in red, "1924" emblazoned across it. Static shot of globe with the Union in red. The date 1924 appears over the map of the USSR. Gradually, little icons appear (I think these are actaully dates but the image is soft and overexposed- hard to decipher) indicating the spread of communism across Europe and China. The changes showing the spread are slow and separated by hot frames - so this was probably edited down later for a voice over accompaniment. Static shot of globe with red USSR and the date 1956 printed on it. This is better exposed than the previous two shots. Camera does an unsteady zoom in to the date 1956 and an insteady zoom out. Exposure changes slightly (lighter) and cam zooms in and out again - still a bit jerky. MSs Soviet-made armaments on display at camp (AK-47 rifles, rocket launchers, machine guns, etc). Low angle MS of a Russian soldier standing at the bottom of a missile, looking up and into the o-ring. MSs of nuclear scientists inspecting the nuclear payload (CU of what might be the uranium cone). LS of Soviet nuclear submarine sailing. CU of finger pushing button. WLS of intercontinental ballistic missile launching from sub. GV bomber plane landing on runway. Wide LS of American F-14 flying through a steep valley. Wide LS of an American naval carrier. 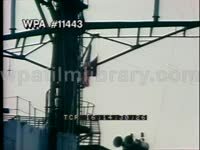 MS of radio tower aboard ship, zoom out to tight LS of vertical landing (VTOL) jet (Harrier?) landing on carrier deck. TLSs American soldiers operating a radar / early warning system. Shots of high school kids playing baseball and skipping rope in schoolyard until they hear an air raid warning; kids file languidly, calmly into school. Shots of four white kids playing in backyard on urban house until they hear air raid siren, at which time they enter their house. MSs of white female teenager walking on street, asking man where to go after hearing an air raid siren; shot of Public Shelter sign. Shots of well-dressed kids in hallway of school demonstrating the proper Duck and Cover method in the event of a "sudden" nuclear flash; same with lunchroom. MSs of two white kids kissing their mom goodbye, leaving house, then walking to school, only to ... duck and cover after an atomic flash; another girl ducks and covers in doorway of building. MS men talking at barber shop. Good MCU Cold War propaganda poster on wall: Enemy Target No. 1-- Civilians. MS newspaper printer with threatening Cold War headlines sup'ed over it: Russ Explode H-Bomb / Atomic Stockpile Grows / AEC Announces New Test / Bigger A-Bombs Needed. MS road sign: U.S. Atomic Energy Commission, Nevada Test Site, Mercury NV. TLS of main gate. Map of area near UT and NV border. Panning LS of desert. MSs of scientists at work, military brass at meeting, technicians assembling test site. TLSs of atomic test tower. More EST shots of small town St. George. Aerials of atomic testing sites. Map of United States, 5000 miles to Marshall Islands "proving grounds". Shots of crates being loaded onto merchant cargo ship. TLSs of bulldozers clearing site for atomic testing site in Marshal Islands. Shots of testing site in Nevada. Color: Great traveling MS Communist Chinese soldiers pointing & aiming rifles affixed with bayonets at camera. MSs Red Chinese (PRC) soldiers working with quarterstaves & armor. President RICHARD NIXON and First Lady PAT NIXON visiting China, Feb, 1972: MSs First Couple alighting Air Force One, shaking hands with Premier CHOU EN-LAI in Peking; MS Richard Nixon & Chou En-Lai inspecting Red Guard, Chinese troops. Construction of the Berlin Wall, Aug 1961: MSs East German soldiers constructing Berlin Wall-- unfurling barbed wire, installing posts, using jackhammer; MS West Berlin mayor WILLIE BRANDT inspecting line of division; MS East German soldiers standing guard over paltry line of barbed wire; MS soldiers pushing West German civilians from fence; MSs border guards on patrol. CU woman crying during escape attempt; TLS/MSs East German civilians crossing the border for freedom, running through barbed wire, leaping from windows. TLSs U.S. tanks & armored personnel carriers rolling along the Autobahn. TLSs President JOHN F. KENNEDY speaking at Berlin, June 26, 1963, intercut with nice shots of enthusiastic crowd: "All free men, wherever they may live, are citizen of Berlin. Therefore, as a free man, I take pride in the words Ich Bin Ein Berliner." Master 1490 - Tape 1 Various views of Snapper atomic event conducted at Nevada proving grounds during Operation Tumbler-Snapper, 1952. Gorgeous dusky colors, the events occuring during dawn or dusk. Aerial of massive 20 kiloton atomic explosion that begins with a blinding flash. Level LS 20 kt atomic blast. WLS 20 kiloton atomic bomb blast, night. Aerials of mushroom cloud, including downright evil-looking TLSs roiling, shifting mushroom cloud. CU Soviet air control man. MS MIG jet fighter taxiing on runway. TLS of an airfield full of Soviet MiG fighters; CU of fighter pilot in cockpit; wide LS of MIGs (MIG-25 Foxbats?) in flight. June 12, 1987 Excerpt from Remarks on East-West Relations at the Brandenburg Gate in West Berlin. Ronald Reagan praises the few thaws of freedom within the Soviet Union, but wonders if the Soviets' expression for change is real or simply an empty token gesture. "And now the Soviets themselves may, in a limited way, be coming to understand the importance of freedom. We hear much from Moscow about a new policy of reform and openness. Some political prisoners have been released. Certain foreign news broadcasts are no longer being jammed. Some economic enterprises have been permitted to operate with greater freedom from state control. Are these the beginnings of profound changes in the Soviet state? Or are they token gestures, intended to raise false hopes in the West, or to strengthen the Soviet system without changing it?" edit "As I looked out a moment ago from the Reichstag, that embodiment of German unity, I noticed words crudely spray-painted upon the wall, perhaps by a young Berliner, "This wall will fall. Beliefs become reality." Yes, across Europe, this wall will fall. For it cannot withstand faith; it cannot withstand truth. The wall cannot withstand freedom." edit "General Secretary Gorbachev, if you seek peace, if you seek prosperity for the Soviet Union and Eastern Europe, if you seek liberalization: Come here to this gate! Mr. Gorbachev, open this gate! Mr. Gorbachev, tear down this wall!" Much applause and flag-waving. 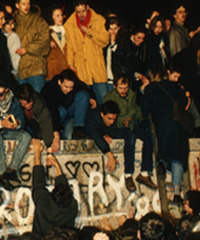 Diss to Nov 9 1989 footage of the Berlin Wall coming down, people climbing it, standing atop it, pulling pieces down; slo-mo celebrations. 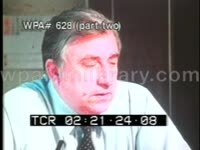 The audio is from June 2, 1988 Excerpt from Remarks Following the Soviet-United States Summit Meeting in Moscow. "I would like to think that our efforts during these past few days have slayed a few dragons and advanced the struggle against the evils that threaten mankind - threats to peace and to liberty." Master 1482 - Tape 2 High angle LS East German Army soldiers marching in strict, tight formation during Red Communist military parade in East Berlin, German Democratic Republic (East Germany). Panning TLS East German Army soldiers wearing dress uniforms and carrying Russian PPD 34/38 submachine guns, marching in tight formation along parade route. LS East German soldiers wearing helmets, riding in treaded Soviet trucks towing field artillery during parade. Panning TLS Soviet T-34-85 medium tank on parade, tank commander leaning out turret hatch. Panning MS field artillery being towed. All equipment and weaponry is Soviet-made. VO: "... Should the Western powers include German troops in a European defense system? Telenews reports on the critical issue. Russia is rearming East Germany. Does that challenge have to be met?" MCU U.S. President JOHN F. KENNEDY (JFK, John Fitzgerald Kennedy, John Kennedy) continues, "We choose to go to the moon. We choose to go to the moon in this decade and do the other things, not because they are easy, but because they are hard, because that goal will serve to organize and measure the best of our energies and skills, because that challenge is one that we are willing to accept, one we are unwilling to postpone, and one which we intend to win, and the others, too." TLS crowd applauding. MCU Kennedy speaking, "It is for these reasons that I regard the decision last year to shift our efforts in space from low to high gear as among the most important decisions that will be made during my incumbency in the Office of the Presidency. In the last 24 hours we have seen facilities now being created for the greatest and most complex exploration in man's history. We have felt the ground shake and the air shattered by the testing of a Saturn C-1 booster rocket, many times as powerful as the Atlas which launched John Glenn, generating power equivalent to 10,000 automobiles with their accelerators on the floor. We have seen the site where five F-1 rocket engines, each one as powerful as all eight engines of the Saturn combined, will be clustered together to make the advanced Saturn missile, assembled in a new building to be built at Cape Canaveral as tall as a 48-story structure, as wide as a city block, and as long as two lengths of this field." Master 1779 - Tape 1 LSs construction of scrolling electronic ticker board in West Berlin, Germany. MS public billboard with West German flag: "Anfang Des Demokratischen Sektors Berlin" (Start of the Democratic Sector of Berlin). LS West Berlin Press newspaper-sponsored tickerboard, construction crews standing on skeletal tower. MSs white male electricians working on board. TLS crowd gathered on street, peering upward. LS scrolling news flash on ticker, night: "Helmut General Mac Arthur Hat Heute Die Nordkoreanischen Truppen." Korean War newsflash, MacArthur has crossed the 38th parallel. VO: "-- before the so-called elections in the Soviet sector of Berlin this week, the Western zone unveiled a new weapon in the propaganda war. This electric soundboard, towering high above the center of the city, is easily seen in the East Zone. Sponsored by West Berlin newspapers, the sign will carry uncensored news, something East Berliners haven't seen since the Russian occupation began. Despite Communist threats, people read the bulletins. First item to be flashed through the night: General MacArthur's troops have penetrated into North Korea. This is one ray of light that passes through the Iron Curtain." MSs ballot box on street in West Berlin, police officer crossing frame; MS sign on bulletin board-- "An Alle Wahler im Ostsektor Berlins!" -- white men placing ballots into box. The propaganda war between East Berlin and West Berlin intensifies, and the democratic right of voting is the pawn. TLS Deutsche Post newspaper delivery truck coming to stop at curb. MSs white men in matching dark blue uniforms unloading mail bags from truck, delivering and emptying contents of sacks in office; MS stack of bundled ballots. MSs white woman opening ballots with letter opener; CU letter. TLS West Berliners opening mail in large room. MSs East Berliners walking past camera, entering polling place, casting ballots; MS four white male press photographers taking pictures, flashbulbs snapping. VO: "Another step to counter the rigged election in Soviet Berlin: these ballot boxes set up in the Western sectors give East Berliners a chance to show their real feelings, since in their own elections they can only pass on a single slate of Communist candidates, and to vote against them might be dangerous. The ballots are brought to West Berlin's city hall. They are in the form of expired ration cards, making sure that no one votes twice. Over half the population of East Berlin took this opportunity to register their voice against Communism. In the Soviet Zone election, where the choice was between casting the ballot in public or secret with suspicion at least falling on anyone voting in secret, officials reported that the Communist Party received 95 percent report. Secret Police were stationed at every polling station. This letter from the Soviet Zone says the Communists are a plague fiercely hated by the people. Western estimates indicate that this attitude is shared by 9 out of every 10 East Germans. Films of the Communist elections were not permitted. Here are unusual pictures of voting in a typical Iron Curtain country. A yes and a No ballot are given to each voter. 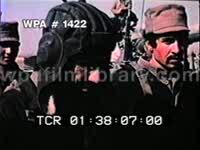 One must be dropped in the box, the other discarded..."
Battle sequence, Afghanistan: TLS/MSs Soviet-made tanks rolling through desert; MSs state soldiers firing AK-47 assault rifles, tossing grenades; MSs explosions; MS/MCUs dead rebel soldiers in ditch; MCUs captured Afghan rebels, some speaking to camera; MSs captured rebels being led by state soldiers through desert valley, laying down arms; MCU cache of rifles. Similar to catalog # 538761 Footage depicting spread of communism from 1924-1956. Cartoon-ish graphic of faceless black figures who gradually turn red. A field of identical faceless cartoon men (black suits, white heads) lined up in rows across the screen. Gradually, every third one of them turns red going from left to right. Good for crude cold war, spread of communism, red scare depictions. MS's American soldiers shoring defense in W. Berlin. NATO: MS's American brass in conference; map of NATO. LS Capitol Building. MS Mr. Truman speaking to Congress. MS DWIGHT EISENHOWER shaking hands w/ French officer at airport. Aerial Arc d' Triomphe. Wattenberg At Large Power Shift. Soviet intelligence ship (Russian Tattletale ship) in the water. Graphics compare Soviets and American strategic nuclear weapons 1970 to 1981. Archival BLK & WHITE: MSs of Polaris missile on flatbed truck, passing by camera, flanked by soldiers, labled U.S. Army . Great color animation circa 1970's of American missile with multiple individually targeted warhead capability (how it works, to what degree of effectiveness). Montage of American cruise missile technology.